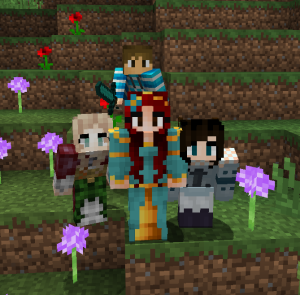 VP CraftyMocha and her kids. I was born and raised in a military family. I married an Airman 21 years ago and have enjoyed moving to new places, meeting new people, supporting my husband as he served in the Air Force, and raising our 3 children. With my husband’s unstable schedule and the mutual agreement that I would be a stay-at-home mom, I focused on being a presence for my family, serving in different areas at church—from children’s ministry, mom’s playgroup, and teaching, to helping administratively at a 2-day preschool. Upon my husband’s retirement from the military 3 years ago, I felt the Lord leading me to homeschool. What an adventure that has been! We discovered MCS during the summer of 2014. I—not a gamer by any means— had just fallen in love with playing Minecraft with them on the Xbox around that time. My kids were crazy about the idea of getting to play their favorite game AND learn at the same time, with others. I decided I wasn’t going to be abandoned for the computer, so, I jumped in with them. With Ms. Jody’s permission, and with a heart to serve and help out in any way that I could, I first joined MCS as a parent moderator. That soon turned into a position as the office administrator! What an amazing adventure it has been to be on staff with MCS. It is with tremendous joy that I look forward to being a part of your students’ MCS experience.